Tonopah & Tidewater caboose No. 402 was one of a group built for the purpose in 1908 by the Seattle Car Manufacturing Company (predecessor of today&apos;s Paccar, a major railroad car builder who also owns the Peterbilt and Kenworth truck companies). It served for many years on the T&T line from the Santa Fe railroad connection in the southern California desert to the Rhyolite and Goldfield mining regions. As traffic declined and the T&T moved toward dissolution, the caboose was sold to the nearby Tonopah & Goldfield, where it also carried the number 402. 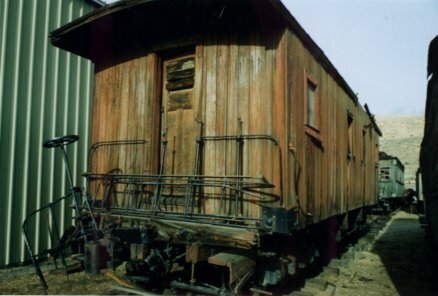 With the end of the T&G after the second world war, the caboose was purchased by a Hollywood studio for use in the movies. Sold to Short Line Enterprises in the early 1970s, it was acquired by the Nevada State Railroad Museum in 1988.